The weather was the hottest in 30 years. Real feel 100 degrees! A real scorcher if I should say so myself and for a time we wondered if anyone would show up. A no-show would be no surprise considering that the night before a brutal thunder storm moved with winds as high as 80 miles per hour. The severe storm knocked out power lines over a wide 30 mile radius and downed large 20 year old trees. Many of the invitees were without power in their homes while others had to contend with structural damage. When we arrived at the park we were glad to see that no trees were down and the pavilions were in good condition. Still we noticed that the power outlets were dead. That meant our well planned surprise mini concert would have to be postponed. Not a disappointment. We would have more time to rehearse and present it during our September event. Just one more thing to look forward to. Still we fired up the grill, blew up and hung decorative balloons and streamers, started up the bubble blowers and made sure we had plenty of iced water and cool water games. Then we waited, and waited and waited. A few hours later a few showed up. An hour later more arrived. In time over 60 filled the two pavilions. The congregation annual Family BBQ had begun. 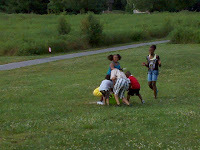 This summer the event would be held at MeadowWood Park in Huntvalley MD. The small park with lots of grassland was a first for us. It had a large playing field, cool shady pavilions and a small stream and cross bridge that local kids used to catch crayfish. Family, friends and friends of friends attended. 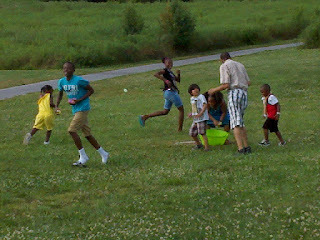 Everyone from little ones to our eldest were fully involved in the activities of the day. As usual Brenda and I did much of the planning organizing and directing. We like to do something different each year and build anticipation weeks in advance. Wonderful memories were made, old friendships rekindled and new ones made. 1. Face Painting - Face painting is indeed a craft requiring some practice. What you need is soft oil based face paint found at any party planning store or craft store. Small soft sponges. Soft bristle paint brushes work well. Stencils for making starts and heart shapes. Paper towels and soapy water for clean up. 2. Bubble Games - Kids will play with this for hours. 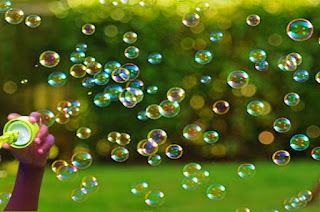 What you need are various bubble wands in all shapes and sizes. A large flat tub full of bubble solution. Water and towels to wash soapy hands and faces. 3. 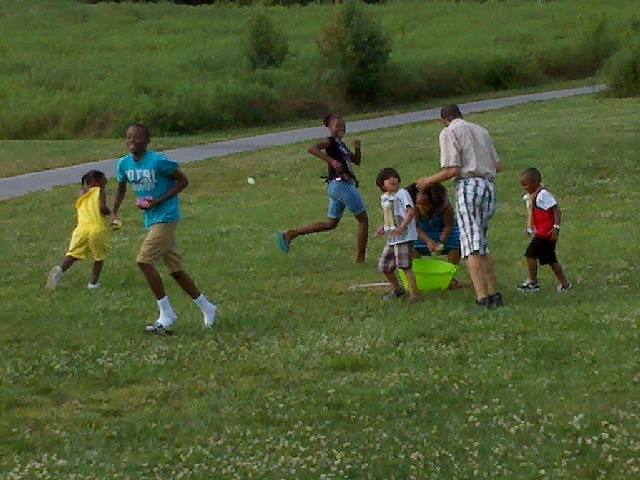 Water Balloon Toss - Water balloons are a wonderful way to cool off in the hot sun. 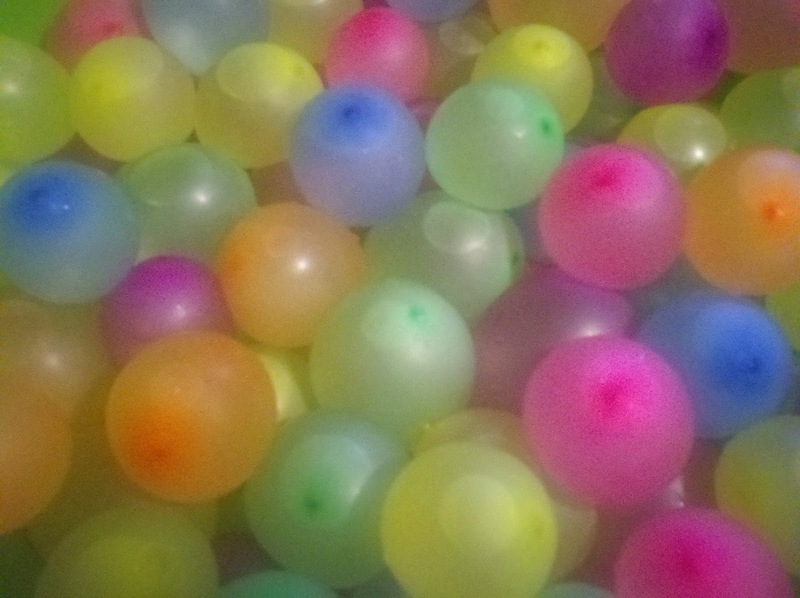 You'll need at least one hundred balloons for 10 minutes of fun. Small balloons are preferred as they are easy to handle and throw. Multiple colors make for a more attractive display that kids can't resist. Avoid over filling the balloon as they will burst as soon as they are handled. 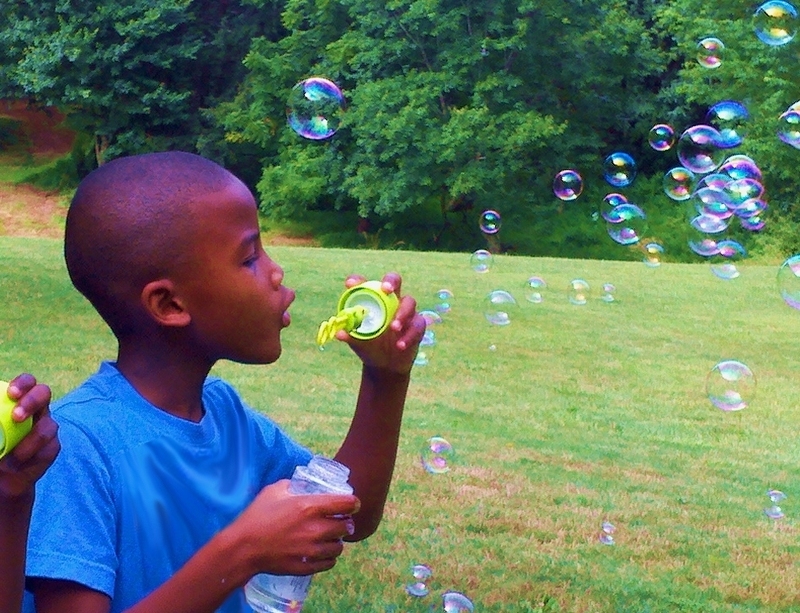 Fill the balloons with cool water only and place in a cool shady place until the games begin. 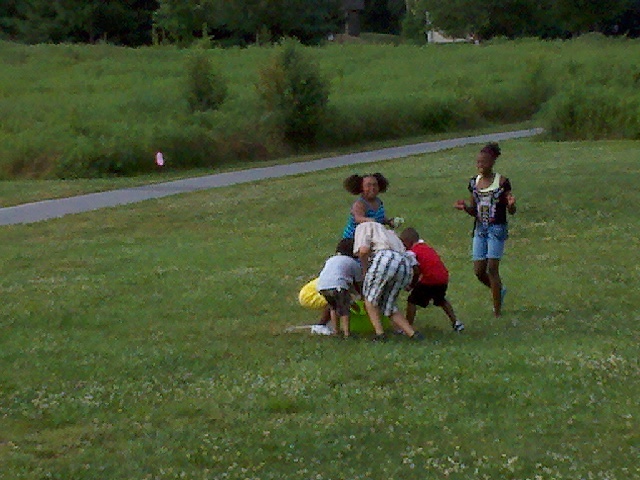 The most exciting activity of the day was throwing water balloons at each other mainly to cool off. The kids and kids at heart loved it. After the games were over we offered stuffed bears, flamingos and monkeys to all the kids who helped clean up the water balloon fallout. They quickly cleaned up and excitedly claimed their prized rewards with great glee. The kids seemed to like the long armed stuffed monkeys best of all.